The castle of Hassonville, in french "Château d'Hassonville", is a castle near Marche-en-Famenne in the province of Luxembourg, Belgium. The castle dates back to the 17th century. The construction of the castle was commissioned by Louis the 14th to Messire de la Veranderie, the governor of Marche-en-Famenne. 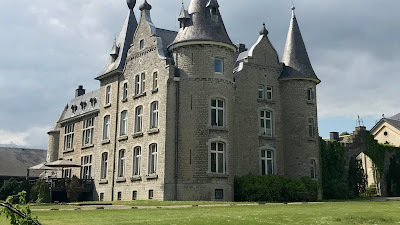 The so called sun king had the castle built after his attempt to conquer the Netherlands, but he was only able to conquer the current province of Luxembourg. The king, however, never occupied the castle himself, which was meant to be a hunting lodge, The original garden was laid designed by a pupil of Le Notre, the designer of the Versailles gardens in France. In 1986 the castle came into the possession of the Rodriguez family, who renovated it completely. The complex is almost exclusively built with natural stone, the local gray limestone was used for the walls. The style emphasizes simple lines. Somewhat different are the facades on the south and east sides of the highest part, which clearly show the forms of Baroque architecture of the time. The castle is located on the west side of a large park with deciduous forest, which is part of a 55 hectare estate. Central in the park is a garden in English landscape style. The castle is now used a a hotel and restaurant and is open to the public. You can find it at this address: Route d'Hassonville, 6900 Marche-en-Famenne.